Sheffield United's League One fixture against Scunthorpe scheduled for Sunday has been postponed following adverse weather conditions in Yorkshire. 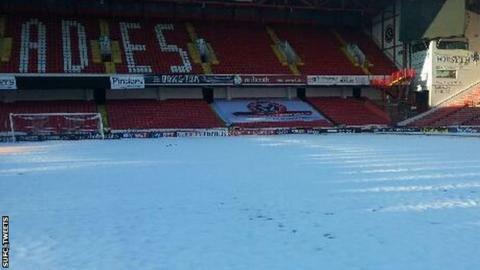 Referee Mark Heywood deemed the pitch playable but said access to Bramall Lane was unsafe, with snow and ice in the surrounding streets. "I'm calling the game off on health and safety grounds," Heywood said. The pitch was covered with almost four inches of snow, but ground staff had worked to clear the surface. Match ends, Sheffield United 4, Scunthorpe United 0. Second Half ends, Sheffield United 4, Scunthorpe United 0. Robert Harris (Sheffield United) wins a free kick in the defensive half. Attempt blocked. John Brayford (Sheffield United) right footed shot from outside the box is blocked. Corner, Sheffield United. Conceded by Conor Townsend. Corner, Scunthorpe United. Conceded by Ben Davies. Substitution, Scunthorpe United. Andrew Boyce replaces Gary McSheffrey. Goal! Sheffield United 4, Scunthorpe United 0. Jose Baxter (Sheffield United) converts the penalty with a right footed shot to the top left corner. Second yellow card to Miguel Angel Llera (Scunthorpe United). Penalty Sheffield United. Marc McNulty draws a foul in the penalty area. Penalty conceded by Miguel Angel Llera (Scunthorpe United) after a foul in the penalty area. Corner, Sheffield United. Conceded by Kevin van Veen. Miguel Angel Llera (Scunthorpe United) is shown the yellow card. Marc McNulty (Sheffield United) wins a free kick in the defensive half. Substitution, Sheffield United. Ben Davies replaces Ryan Flynn. Goal! Sheffield United 3, Scunthorpe United 0. Jamie Murphy (Sheffield United) right footed shot from the centre of the box to the high centre of the goal. Assisted by Kieron Freeman. Attempt saved. Robert Harris (Sheffield United) right footed shot from outside the box is saved in the centre of the goal. Substitution, Sheffield United. Michael Doyle replaces Paul Coutts. Marc McNulty (Sheffield United) wins a free kick in the attacking half. Substitution, Scunthorpe United. Kyle Wootton replaces Hakeeb Adelakun. Substitution, Sheffield United. Marc McNulty replaces Steve Davies. Attempt missed. Kevin van Veen (Scunthorpe United) right footed shot from outside the box is close, but misses to the right from a direct free kick. Liam O'Neil (Scunthorpe United) wins a free kick in the defensive half. Foul by Jose Baxter (Sheffield United). Kevin van Veen (Scunthorpe United) wins a free kick in the defensive half. Corner, Sheffield United. Conceded by Liam O'Neil. Corner, Sheffield United. Conceded by Jordan Clarke. Ryan Flynn (Sheffield United) wins a free kick in the defensive half. Attempt missed. Gary McSheffrey (Scunthorpe United) left footed shot from the left side of the box is high and wide to the right. Paul Coutts (Sheffield United) wins a free kick in the attacking half. Substitution, Scunthorpe United. Kevin van Veen replaces Isaiah Osbourne. Foul by John Brayford (Sheffield United).